Patients Beware. Fake Botox Is On the Rise in the US Dr. John R. Burroughs Warns. Don't be afraid to verify that the medical degree hanging on the wall is real by checking with the college and medical associations. Second, any real medical professional will always perform the Botox procedures at their office,not a kiosk at a mall. In the ongoing quest to maintain a healthy, youthful appearance, individuals are willing to go to great lengths to achieve their dreams. This has led to a significant rise in cosmetic procedures, and one product, Botox, has really embedded itself into the popular consciousness. While Botox does have marked medical applications, it has primarily soared to its current level of popularity due to its ability to banish wrinkles due to paralyzing facial muscles. 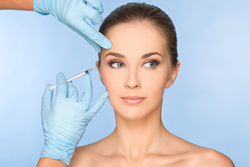 The number of Botox procedures being done on a yearly basis has skyrocketed since 2000. In that year, there were a total of 786,911 Botox procedures done, and that number has since surged to 6,673,608 by 2014. (1) There is no doubt that Botox is big business, which can be seen in that the manufacturer of Botox, Allergan, sold $2.2 billion worth of Botox in 2014 alone. (2) Such financial success also means that criminal enterprises will try to get a slice of the action for themselves. As such, licensed medical professionals, such as Dr. John R. Burroughs of Springs Aesthetics, have warned patients to be on the lookout for scammers peddling fake or diluted versions of Botox. Botox has definitely become mainstream over the last decade, even to the point where people are throwing Botox parties where they and their friends drink wine while getting injections. Medical associations, such as the American Society of Plastic Surgeons, do not recommend such events as such injections should always take place in a sterile environment by an experienced medical professional, such as Dr. John R. Burroughs of Springs Aesthetics. As Botox is a minimally invasive procedure, its cost is less than other cosmetic procedures, such as facelifts. In 2015, the average cost for a Botox treatment ranged from $350 to $500 for each area injected. (3) Yet it seems that a good number of people are always willing to look for a cheaper bargain, even for medical care. For the sake of a few dollars, people are willing to trust a shady or unlicensed person to inject them with what they believe is legitimate Botox, which is what criminals are looking for while selling their illegal wares. The results of being injected with diluted or fake Botox can be disastrous. One should always be aware of the harmful effects of receiving a fake Botox injection. There are steps that a person can take to safeguard their health when looking to smooth away those wrinkles with an injection of Botox. First, one should make sure that they're dealing with a legitimate medical professional, such as Dr. John R. Burroughs of Springs Aesthetics. Don't be afraid to verify that the medical degree hanging on the wall is real by checking with the college and medical associations. Second, any real medical professional will always perform the Botox procedures at their office, not out of their car or at a kiosk. A final method to protect oneself from fake Botox is to inspect the label of the product to ensure that it is FDA-approved and is for use in humans. If one feels any suspicion that they will not be getting a legitimate Botox injection, do not get the procedure done and then notify the appropriate authorities. Cutting corners to save a few dollars is not a wise decision when it comes to one's health. About Springs Aesthetics and Dr. John R. Burroughs of Colorado Springs, CO, 80907 - Dr. Burroughs is a specialist of the eyelids, orbits and face. Dr. Burroughs has treated tens of thousands of patients, and is a “doctor’s doctor” frequently requested by other physicians and nurses to perform surgery on themselves or their family members. He has performed thousands of periocular and facial procedures and surgeries. He has 20 years of botulinum neuromodulator (Botox®) experience, and also offers at Springs Aesthetics Medspa non-surgical facial rejuvenation treatments with dermal fillers, chemical peels, fraxel, skin tightening, cellulite reduction, photofacials, laser hair removal, and Latisse®. Dr. Burroughs is often asked to lecture upon, write, and review professional publications on topics of eyelid, facial rejuvenation, and reconstruction. He is frequently consulted, by other surgeons, to repair complications arising from surgery performed around the eyes. He performs over a 1000 surgical procedures on over 600 patients annually.